Softly steam the potatoes. Drain them, let them cool and cut them into thin slices. 2. Peel the onion, cut it in half, then cut into small slices. 3. 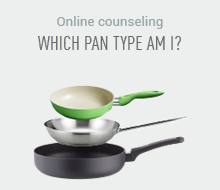 Heat ½ tablespoon of the olive oil in the Montana flat pan. Add the onions and first fry them under medium heat until they get glassy, then shortly continue frying while stirring. 4. Loosely whisk the eggs in a bowl. Add potatoes and onions, season with salt and pepper. 5. Heat 2 tablespoons of the oil in the Montana pan. Poor the mixture in the pan, fry shortly under high heat, then switch to low heat. Loosen the solidified egg mixture from the rim of the pan with a stirring spoon and allow still runny egg to flow back. 6. Fry the tortilla under low heat for approx. 10 minutes. When the tortilla is solid almost up to the surface, cover the pan with a large plate. Overturn the tortilla on this plate. and let it fry for several minutes, until the other side is also golden brown. 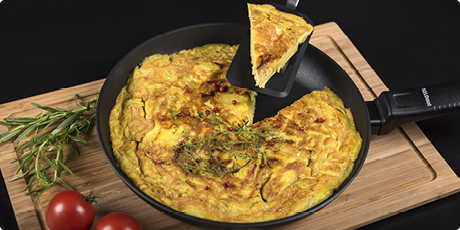 Hot from the pan, the classic Spanish potato tortilla is very tasteful with a large colourful salad as a main course. However, this traditional dish is also very good cold and a good idea to bring to work or school for lunch. 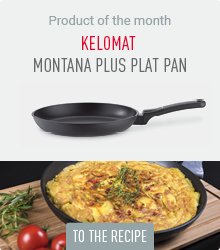 Thanks to its flat rim, the MONTANA PLUS flat pan is suitable for all dishes that have to be turned, like cooked meat or egg dishes.